Recently I received an e-mail showing crescent and star shaped Islands. It looked too good to be true. So I made a thorough search on the internet and found that it is a morphed image. 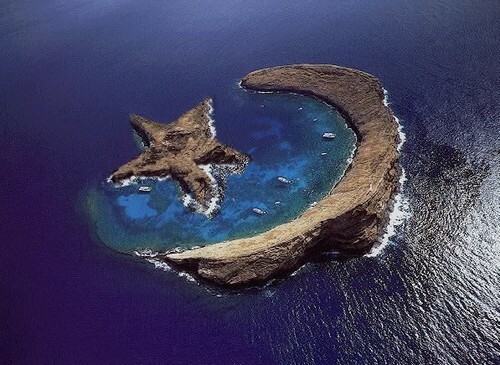 A moon shaped islet does exist, however the star is fake. 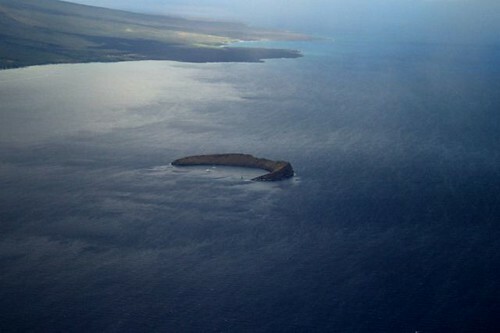 The islet is Molokini, a crescent-shaped, partially submerged volcanic crater in Alalakeiki Channel between the islands of Maui and Kaho'olawe, part of Maui County in Hawaii. It has a diameter of about 0.4 miles (0.6 km). Its crescent shape protects divers from waves and the channel's powerful currents and it is a popular tourist destination for scuba diving and snorkelling. Reportedly it is one of the top 10 dive spots in the world.